Is America a Christian nation? 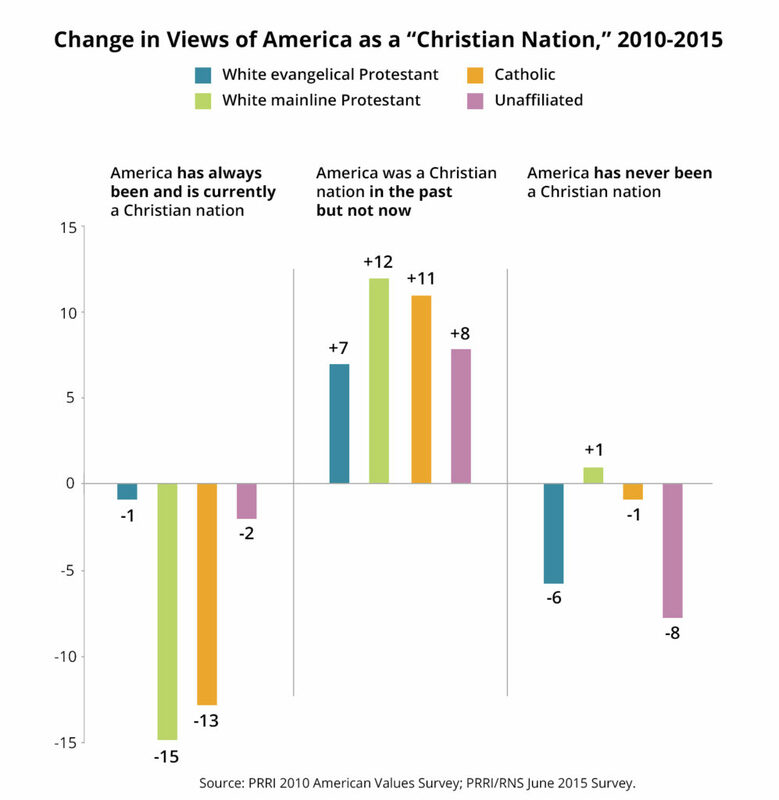 We know from a previous PRRI analysis that between 2010 and 2015 there has been a small 7-point decline in Americans who believe the country is a Christian nation and a subsequent 8-point rise in those who say it was a Christian nation in the past but is no longer one today. With the presidential inauguration and its religious undertones right around the corner, we wanted to see how different religious groups, including the religiously unaffiliated, have shifted their perspectives on whether America is a Christian nation in the last five years. Overall, these groups follow the same patterns as the public: A decline in those who say America has always been and is still a Christian nation and a rise in those who say the country was a Christian nation but no longer is one. But for two groups in particular—white mainline Protestants and Catholics—these changes are much more pronounced. White mainline Protestants have seen a 15-point drop (from 48 percent to 33 percent) in those who say “American has always been and is currently a Christian nation,” and a 12-point rise (from 36 percent to 48 percent) in those who say “America was a Christian nation in the past but not now.” Catholics have similar double-digit movements. Catholics have seen a 13-point decline (from 52 percent to 39 percent) in those who say the U.S. is a Christian nation, and an 11-point rise (from 30 percent to 41 percent) in those who say the U.S. used to be a Christian nation but is no longer. White Christians altogether have seen a 7-point drop (from 48 percent to 41 percent) in those who say American is and has always been a Christian nation, and an 11-point increase (from 39 percent to 50 percent) in those who say the country used to be a Christian nation in the past but is not one now. Additionally, more white evangelical Protestants and the religiously unaffiliated say the country used to be a Christian nation but is not anymore. Evangelicals jumped seven points in five years—from 49 percent to a majority 56 percent—and the unaffiliated moved eight points from 32 percent to 40 percent. For more, read our previous post this topic, the survey from which it was drawn, and The End of White Christian America.